YOUR HIT PARADE'S JOAN EDWARDS & FRANK SINATRA, JUDY CANOVA AND TRUTH OR CONSEQUENCES' RALPH EDWARDS LED SATURDAYS. Melody and mirth dominated the list of 16 shows that scored three or more Top Ten finishes on Saturday and qualified for the night’s All Time Top Ten. It was where listeners could hear their pop music favorites presented in order on Your Hit Parade, (Joan Edwards & Frank Sinatra), the rural music and comedy of Grand Ole Opry, National Barn Dance and Judy Canova, (c), the joke filled fun of Can You Top This? and the outrageous stunts of Truth Or Consequences, (Ralph Edwards & contestant). The only breaks in the lighthearted variety came with the gritty Gangbusters and puzzling mysteries of Ellery Queen. What’s missing from Saturday besides news and drama? Although Al Jolson, Bing Crosby, Bob Hope, Fanny Brice and Grucho Marx all spent a season or two on Saturday, they all moved on to other nights where larger audiences and bigger ratings were available. 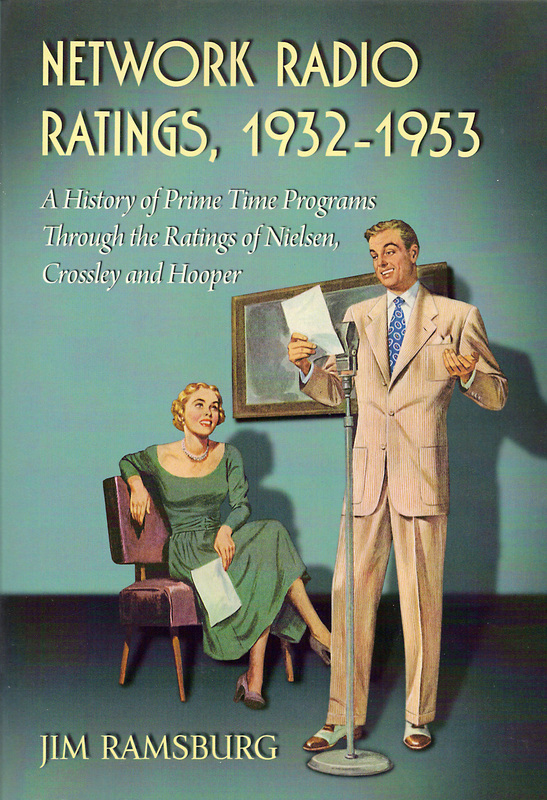 And when the networks began to cut back prime time programming in the wake of television’s surge, what was the first night to feel the cuts in 1951? Saturday radio listeners became Saturday television viewers gazing at Sid Caesar & Imogene Coca’s Your Show of Shows and Jimmy Durante rotating with Danny Thomas, Ed Wynn and Jack Carson on The All Star Revue. But before its party ended, Network Radio provided millions of Saturday night listeners with countless hours of fun and music. Below are the 16 candidates for Saturday’s All Time Top Ten, listed in alphabetical order. Can you pick the the big ten in order? Hint: Seven of the Top Ten had strong music elements and four of them leaned toward what was then called country & western music. You'll find the winners below the cover of the familiar book from which we determined them. 3/ The National Barn Dance was already eight years old on WLS/Chicago when it began its 15 season multi-network run on Blue in 1932. It moved to NBC in 1940, was cut to 30 minutes in 1942 and returned to ABC in 1948, but never left Saturday night The parade of rural singers, musicians and comedians hosted by jovial Joe Kelly - also the quizmaster of The Quiz Kids - brought early fame to future stars Gene Autry, Red Foley, Smiley Burnette, Pat Buttram, Rex Allen, Eddie Dean, George Gobel and Bill Haley. National Barn Dance never finished higher than third place on Saturday, which it did only once. But added to its one fourth place finish, six seasons in fifth place, and one each in sixth through tenth, the long-running country jamboree accumulated 66 points. 4/ Gangbusters began and ended its 18 season run during the Golden Age on CBS with eight years on Blue/ABC sandwiched in during the 1940's. The Phillips H. Lord creation based on local police files first appeared on Saturday for one season in 1939-40 and finished first in the night‘s Top Ten. But new sponsor Sloan’s Liniment moved the docudrama to Blue’s Friday schedule in 1940, not to return to Saturday until 1945 with a fifth and eighth place finish. At mid-season in 1948-49 General Foods took control of Gangbusters and moved it back to CBS where it climbed from one season in seventh place to third, to two seasons in second and climaxed in 1952-53 where it began 18 years earlier, in first place. Gangbusters’ Saturday total was 59 points. 5/ Judy Canova was billed as “The Queen of Country Comedy” and her show lived up to the billing. The veteran of a rural themed vaudeville act with siblings Zeke and Annie, Judy also starred in a string of low budgeted Republic films as a country bumpkin who outsmarted the city slickers. Her radio sitcom combined both her talents as a singer and comedienne, surrounded by a top flight supporting cast led by Mel Blanc. After a slow start on CBS’s Tuesday schedule in 1943, her show was moved by Colgate to Saturday on NBC in 1944-45 where she registered three fourth place seasons and four in second for 57 points. 6/ The Grand Ole Opry from WSM/Nashville became a Saturday fixture on NBC in 1939 although it wasn’t recognized in the ratings until 1941-42 when sponsor R.J. Reynolds’ Prince Albert Tobacco put it on the full network. In many ways NBC’s half-hour pickup of WSM’s hours-long Saturday night broadcasts dating back to 1924 was compared to its northern cousin, National Barn Dance . The two shows gave NBC a definite rural flavor in the mid-40’s. The Grand Ole Opry’s Saturday ratings resulted in four fifth place seasons, three in sixth, two in seventh and three in eighth resulting in 56 points. 8/ Gene Autry’s Melody Ranch combined action-adventure and music similar to the singing cowboy star’s string of hit movies. Brought to CBS by Wrigley Gum in early 1940, Melody Ranch was scheduled on early Sunday evening to appeal to youngsters, Autry’s primary movie audience. After two years' service in World War II, Autry returned to Sunday evening on CBS and found himself pitted against Jack Benny on NBC, a no-win situation. The show was finally moved to Saturday night in 1948-49 where it became the night’s Number One show two years later. Combined with finishes in second, third, sixth and eighth place Melody Ranch lassoed 35 points. 9(t)/ A Day In The Life of Dennis Day was, like The Phil Harris & Alice Faye Show, a successful NBC sitcom spinoff starring a popular member of Jack Benny’s cast. Irish tenor Dennis Day portrayed the same boyish, naïve and often confused character he established on Benny’s show. The show with the long name debuted on Thursday in 1946 then moved to Wednesday at mid-season where it remained for another year, both times scoring in the night’s Top Ten. Moved by sponsor Colgate to Saturday in 1948-49, A Day In The Life of Dennis Day became that night’s Number One program for two consecutive seasons but tumbled to fifth in 1950-51 when it was converted at mid-season to a variety show. The singer-comedian‘s final Saturday total was 26 points. 9(t)/ Vaughn Monroe was the most popular singing bandleader of the 1940’s. With a deep baritone voice he sold over five million RCA Victor records including Billboard’s Number One song of 1949, (Ghost) Riders In The Sky. The handsome Monroe, who was also a skilled trumpet and trombone player, was brought to CBS in July,1946, by R.J. Reynolds’ Camel Cigarettes. He settled into Saturday night in October for the remainder of his Network Radio run - six seasons on CBS and one on NBC. His five Saturday Top Ten finishes included one in third place, two in sixth and two in seventh for 26 points. The other six eligible weekly programs with at least three Top Ten finishes on Saturday were led by Abie’s Irish Rose and The Life of Riley which each totaled 24 points. The rest of the pack were Professor Quiz - 23, The Adventures of Ellery Queen - 19, Saturday Night Serenade - 14, and Russ Morgan’s Orchestra - 12.